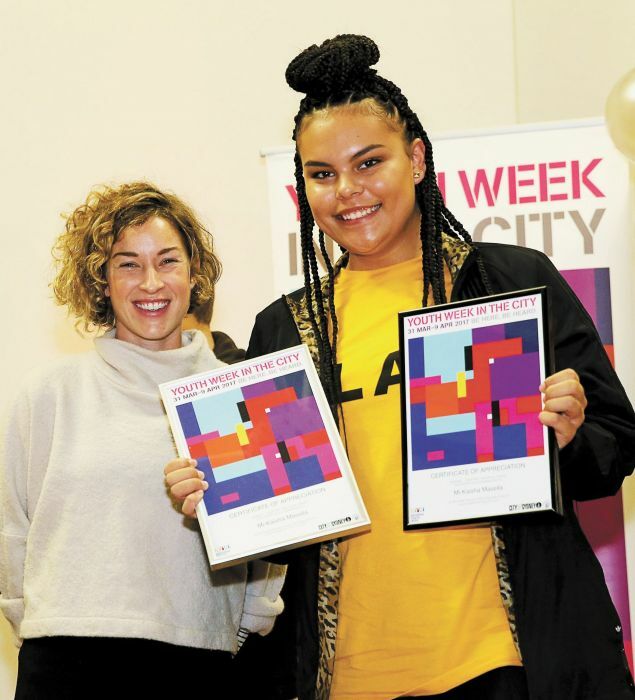 A youth services counsellor, a team leader with Take Kare and a drug and alcohol program run by youth volunteers were among those applauded for contributions to the community at the annual Betty Makin Youth Awards in April. Hosted by the City of Sydney at Redfern Town Hall, the awards include five individual categories as well as a group award for outstanding partnership. Individual award winners each received a scholarship of $500 to be used towards educational, vocational and community projects by young people. “Betty Makin was a remarkable social activist who made life better for inner-city communities – especially young people and their families – and these awards honour young people she would have been proud of,” said Lord Mayor Clover Moore. Siobhan, a former Aboriginal caseworker/counsellor and current operations manager at Weave Youth and Community Services, has made a significant difference to the lives of many local young people for more than 15 years. She played a key role in the development of Just Reinvest NSW, advocating against the over-representation of Aboriginal young people in custody. Laura is a team leader with the Take Kare – a program that operates in Sydney CBD and Kings Cross from 10pm-4am on Friday and Saturday nights, providing support to intoxicated and vulnerable young people. Laura started with the Take Kare Safe Space program in Kings Cross in July 2015, where she was pivotal to the successful implementation of the trial, resulting in secured funding for the program for an additional three years. Since the program launched in Kings Cross, Laura and her team have provided support to 8,716 people, 5,930 of these under the age of 25. Fuzzy is an Australian Red Cross program that promotes health and wellbeing through education, service and support on youth health issues, particularly those related to alcohol and other drug use, and mental health. The SAM crew, made up of youth volunteers aged 18-35, conduct health promotion and basic first aid at music festivals. In 2016, SAM and Fuzzy developed a Harm Minimisation Training program for bar and event staff, to equip them with the skills and knowledge to deal with patrons who are experiencing adverse effects from alcohol or drugs and might be at risk of overdose. For the past three years Felix has identified as a transgender student in a co-ed school environment. Faced with challenges from fellow students he has shown great resilience, and when he speaks about issues close to home, he has the attention of students and their respect. Felix is a bright young student who hopes to work with LGBTIQ community, helping others through the process of coming out and/or identifying as a transgender person. Sanja, a student at St Scholastics College, has demonstrated strength, determination, maturity and flexibility over the past three years as she pursues her education whilst dealing with regular seizures. Despite her ongoing personal challenge, Sanja is a role model for others with a positive outlook that never dampens her spirits. With the support of her family and medical team, Sanja works hard to keep up with her school work, as she endures ongoing tests and hospital stays. An avid cook, Sanja hopes to pursue a career in the food industry. Through her songwriting and music, Mi-kaisha uses her creativity to share stories and messages with young people, particularly the inner city Aboriginal community. Performing at venues across Sydney, Mi-Kaisha uses her music to challenge people’s ideas and understanding of what it’s like to be a young urban Aboriginal woman in Sydney. With aspirations to study music at university and become a professional recording artist, Mi-Kaisha takes pride in being an Aboriginal young woman and is dedicated to her community responsibilities in giving back and supporting her community. Evalena is the President of the Amnesty International Committee at Fort Street High School where she recently organised and managed a day of activisim. An advocate for diversity and cultural sensitivity, she has inspired her school mates to better understand current issues and to engage in dialogue and activism around human rights issues. Evalena is currently involved in fundraising activities for Refugee Week, volunteering opportunities with United Nations (UN) Youth NSW and will attend the 2017 State Conference “Multiculturalism in a Changing World” in Queensland. Sandy has played a vital role in the local community as a program producer and presenter and youth volunteer coordinator at 2MFM (Muslim Community Radio). Sandy, currently in her final year of a bachelor’s degree, began her journey as a radio presenter with no formal media qualification, but was determined to make a difference within the local community. She hosts a program, Community Connect, to help raise awareness within the local community of social, health, economic, political and educational issues.